RAWABI, West Bank — In the newest city in the wannabe state of Palestine, the developer Bashar Masri is putting the finishing touches on his mall. Not just any mall. “A shopping experience,” as luxe as any in Israel, with aspirational sneakers, designer handbags, all the international brands never available here before. to open in the new Palestinian city. 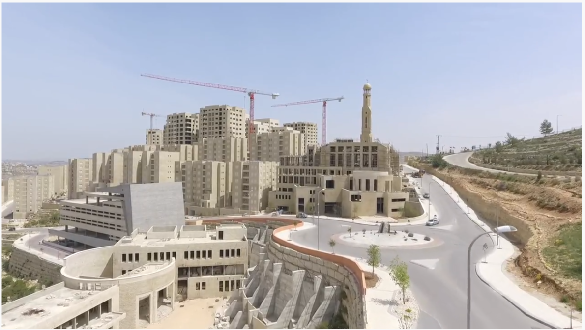 The grand opening of Rawabi’s “Q Center” — named after the city’s Qatari backers — is just days away at the end of May, and the open-air promenade was swarming with Palestinian construction crews. Sparks were flying in the night air. Workers going round the clock, hanging signs, stocking shelves. Masri was a blur of motion, barking at the engineers trailing behind with clipboards and walkie-talkies. Masri opened his laptop to show me a photo sent by a resident the day before. There were four Israeli soldiers and a jeep pulled across Rawabi’s main entrance road, a “flying checkpoint,” temporary but ominous to Palestinians, who are forced to show IDs, open their trunks and explain themselves — just to get home. As the Israeli occupation begins its sixth decade, what does it feel like, not just to the Palestinian laborer negotiating with an Israeli soldier at a checkpoint — but a Palestinian master of the universe like Masri, who commutes in private jets and hosted the former U.N. secretary general for lunch at Rawabi? 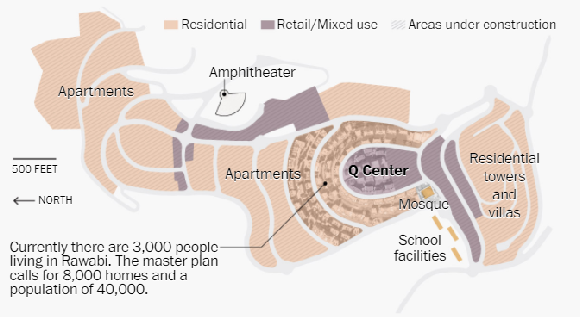 The master plan for Rawabi calls for 8,000 homes and a population of 40,000 on the hilltop, surrounded by areas that today are under partial or complete control — civil or security — of the Israeli military. 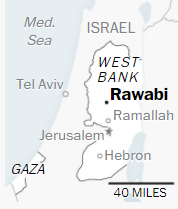 If completed, Rawabi will be bigger than all but a handful of the 126 Jewish settlements in the West Bank — communities that are branded illegal by most of the world, although Israel disputes this. But during my visits, his city felt empty to me — hopeful but lonesome. “But we don’t know whether Rawabi will succeed or not,” Sarsour said. The Palestinians could launch another uprising. Palestinian youth, goosed by incitement on Facebook, personal trauma, mental illness, dreams of paradise or nationalist fervor, could start stabbing and ramming their family cars into Jews again — or Hamas cells could kidnap Israeli teens, as they did in the summer of 2014, which sparked the last of three Gaza wars. With land and money, Masri needed a road to the site to do the excavation work that would take six years. The road to Rawabi goes through Area C, the 60 percent of the West Bank where the Israeli military has complete control — not just security but building permits. “If I don’t believe, even for a minute, I will lose all my energy,” she said. “So I believe. 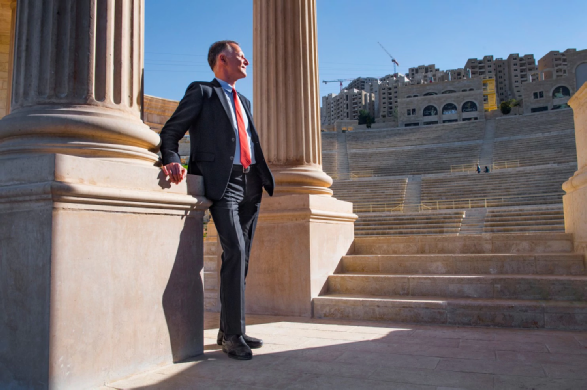 Is this privately financed city project in the heart of occupied West Bank a momentous trailblazer, or a colossal folly? When finished, Rawabi will have space for 25,000 people. 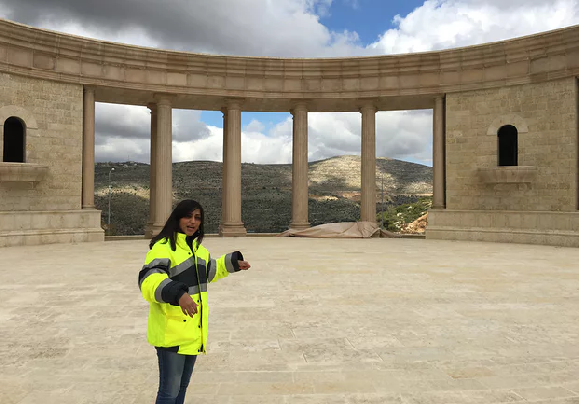 In a hi-vis jacket and jeans, Shadia Jaradat pauses on a tour of Rawabi, a new city rising out of a West Bank hill, to point up at the top floor of an apartment block. “That one is mine,” she says with visible pride, before continuing her exposition of Rawabi’s considerable merits. 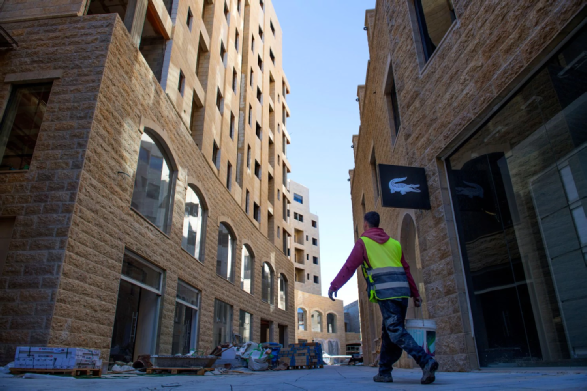 This privately financed city project in the heart of occupied West Bank symbolises both a possible future for the beleaguered Palestinian people and a microcosm of the obstacles they face. That it has got this far in a place under military rule for almost half a century, and in the teeth of obstruction, controversy and criticism, is a testament to the vision of its founder and driving force, Basher al-Masri. Civil engineer Jaradat is one of a team of young women professionals helping to build Rawabi. She has also made this $1.2bn (£825m) paean to contemporary urban planning her home, countering a long tradition which dictates that Palestinian women stay with their parents until they marry, after which they move in with their in-laws. Jaradat: young, female, educated, professional, independent. Rawabi: new, modern, clean, high spec and hi-tech. Both represent a break with the past, but their potential is mired in the cyclical violence and political obduracy characteristic of this part of the world. Our tour of Rawabi – Arabic for “hills” – takes us through the first two city neighbourhoods to be completed since construction began in 2012. Seven hundred apartments have been sold, with the first residents moving in last autumn. Eventually, Rawabi will have a population of 25,000 in the core high-rise city, which could rise to 40,000 with future expansion. The city is an urban planner’s dream, and the antithesis of the noisy, rubbish-strewn chaos of most Palestinian towns. The apartments have spectacular views over the biblical landscape of the West Bank. Birds of prey soar through the golden evening light. From the highest spots, it is possible to see the Mediterranean glinting beyond the Tel Aviv skyline, 25 miles away. Residential blocks are connected by landscaped walkways, communal gardens and squares, with vehicles restricted to outer roads and underground car parks. Power and telecommunications are delivered by underground fibre-optic cables. Children’s play areas, outdoor gym equipment and benches are scattered through each neighbourhood. The apartments are finished to a high specification, with modern kitchens, integral appliances, tiled floors, recessed lighting and communal stores to keep garbage out of sight. Heating and air conditioning is delivered from a central source. Each flat has a balcony or terrace; there are 100 variations of design. The smallest two-bedroom apartments sell for about $65,000. A four-bedroom apartment could cost up to $150,000. A few top-of-the-range penthouse units have higher prices, but in general they are about 25% cheaper than comparable properties in nearby Ramallah, the overcrowded – and hence overpriced – economic and political hub of the West Bank. Rawabi’s commercial centre has retail spaces, cafes and restaurants awaiting occupancy. “We’re trying to convince international brands, like Mango and Zara, to open here,” says Jaradat, noting that, as yet, there are no global chains in the West Bank. The blueprint includes copious office space, a creche, a seven-screen cinema, a convention centre and a hotel. Rawabi sends a message to the international community. Several mosques and a church will provide worship space for the population. An industrial zone is situated on the city’s outskirts. One school is built, and another is planned. In a slick marketing centre, potential buyers can inspect scale models of the project, view a 3D promotional movie and consult representatives of Arab banks on finance options. And then there is Rawabi’s jewel: a vast, stunning 12,000-seat outdoor amphitheatre built into the hillside. Here, it is hoped, international artists will perform to audiences attracted to Rawabi from all over the West Bank and beyond. A soccer stadium, water park, all-terrain recreation vehicles, an overhead zipline – all add up to an ambitious plan to make Rawabi a desirable place to live and a popular destination to visit. But – especially here – not everything goes according to plan. The Palestinian-American businessman talks of his new city with passion. “This project sends a clear message. Despite all the obstacles the [Israeli] occupation puts in our way, we are determined to improve our lives and have our own state. “This is a mega-project, designed first for Palestinians. People stand on the top of the hill here and say: ‘Wow! This is for us?’ They see other places – in Dubai, Israel, the UK, America – on the internet, and now they see it in our own land, built by our own engineers and labourers. It brings national pride – yes we can, yes we can make a difference, despite all the misery. In 2012, ground was broken. By the middle of 2013, 600 apartments had been sold off-plan and another 8,000 people had registered as potential buyers. A year later, the first properties were finished and phase two was well under construction. But by early 2015, Rawabi was a ghost town and Masri was contemplating bankruptcy. A finalised neighbourhood in the new Palestinian city of Rawabi. The issue that drove him and his mega-project to the edge of disaster was water. Masri spent two years trying to secure a dependable and adequate supply. Without it, Rawabi was dead. 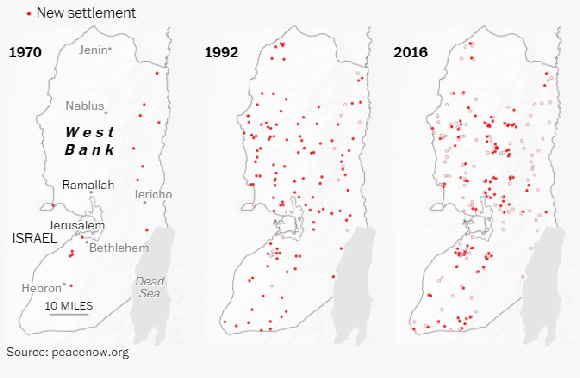 Israel took control of West Bank water resources almost 50 years ago, when its occupation of Palestinian territories began. Under the Oslo Accords, signed in 1993, a Joint Water Committee (JWC) between Israel and the newly created Palestinian Authority (PA) was set up. The PA allocates water supply within the West Bank, but the amount of water supplied is determined by Israel. Any water deal for Rawabi needed to be agreed by the JWC. But the PA was mostly refusing to deal with the body in protest at the vastly favourable supply of water to Israeli settlements compared to Palestinian towns. In desperation, Masri appealed to his friends in international business and politics to intervene. One who advocated on behalf of Rawabi was former British prime minister Tony Blair, who would resign as Middle East envoy a few months later. “Blair was a supporter of Rawabi. He’s been here several times, he’s helped clear [political] obstacles,” says Masri. Tony Blair plants an olive tree at Rawabi in June 2010. The water deal came through in March 2015. “We were allocated a quota of 300 cubic metres a day. Now, we’re already at the top of the quota, and we need more. But all Palestinian cities have water problems, all are asking for more water,” says Masri. Water was not the only problem. Rawabi is situated in Area A, the 18% of the West Bank that is under Palestinian control. But access to the city lies through Area C, the 60% that is under full Israeli control. Masri had to negotiate for permission to build a road on which trucks could deliver construction materials and cars and buses carry Rawabi workers – and, eventually, give Rawabi residents access to the rest of the West Bank. “It was discussed at the White House, with [UN secretary-general] Ban Ki-moon, with everyone. Finally we started digging, putting facts on the ground with this road. Eventually, in 2012, with a lot of international pressure, they gave us a temporary permit for the road, But every year it has to be renewed, or they could close the road,” says Masri. An architect model of Rawabi. The delays took their toll. “Before, for every unit I had 10 possible buyers. It became hard to find any.” The project is now three years behind schedule and has a funding shortfall of at least $150m, says Masri. But the setbacks and difficulties go beyond the road and water delays. “To my knowledge, not another city in the world has been financed completely privately – every single thing from A-Z: sewage, water, schools, telecoms, electricity, roads, religious places. Everything is paid for by us, and we’re not happy with that,” says Masri. At the very least, he says, the PA could have directed international donors to Rawabi. The project was announced just before a conference in Paris in December 2007, at which billions of dollars in aid was pledged to boost the Palestinian economy and state-building projects. Masri, 55, was born and raised in Nablus, a major commercial centre of the West Bank and a city which reputedly produced more suicide bombers than any other during the violent years of the second intifada, or uprising. He is a member of one of Palestine’s best-known and wealthiest families; his uncle Munib al-Masri is a prominent businessman and philanthropist, sometimes called the Godfather of Palestine. After studying and working abroad, mainly in the US, Bashar al-Masri returned to the West Bank in the mid-90s at a time when hopes for a lasting settlement to the long-running Israeli-Palestinian conflict were high following the signing of the Oslo Accords. I want to convince Google and Microsoft to create jobs here. We could be a centre of outsourcing. Why not? But Israel’s occupation of the West Bank, Gaza and East Jerusalem continued, Israeli settlements within the Palestinian territories multiplied, and the prospects of a Palestinian state receded. Masri launched a newspaper and built a successful business – and thought hard about how to breathe life into the dying Palestinian economy. Slowly his dream of a new city, a new beginning, began to take shape. He drew on the expertise of international planners and architects to flesh out his vision, and secured funding from Qatar to augment his own massive investment. He bought the hilltop site as a deliberate riposte to Israeli settlers who sought out commanding positions for their burgeoning colonies (Palestinian towns and villages are usually found on valley slopes). Key to Masri’s dream was a sustainable city, attracting investment and jobs to the West Bank. His ambition was to lure hi-tech and service industries to the empty office spaces above Rawabi’s shopping mall, where they could take advantage of a relatively low-cost but highly educated and tech-minded young workforce. A display living room in an apartment in Rawabi. Rawabi has many critics. Some Palestinians have belittled it as a vanity project for Masri. Some say the cost of housing is way beyond the reach of most Palestinians, for whom a long-term mortgage is impossible. Some worry that the concept of small units for nuclear families or solo dwellers challenges traditional social norms whereby extended families live grouped together, providing mutual care for the old and the young. And some accuse Masri of cosying up to Israel in order to get his project off the ground. These critics say Rawabi risks “normalising” the Israeli occupation of the West Bank by embarking on such a major venture ahead of securing a Palestinian state. Some say his dealings with the Israeli authorities amount to “whitewashing” or “collaboration”. It is true that Masri has negotiated with Israel over the water supply and the road, and that much of the construction materials used to build Rawabi came from Israeli suppliers. 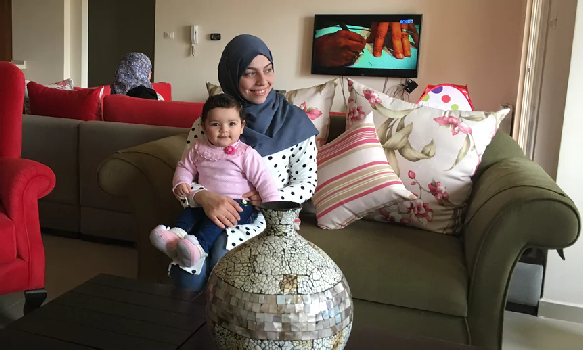 Rawabi resident Mai Alzarou and her nine-month old daughter. But, Masri concedes, anti-Israel slogans have resonance at a time “when Palestinians are being killed in cold blood”. Between October 2015 and March this year, 30 Israelis and two Americans died in a wave of stabbings, shootings and car-rammings by Palestinians. Over the same period, more than 200 Palestinians were killed, the majority while allegedly carrying out attacks. It has also been a setback for Masri’s ambitions to attract tech companies to Rawabi. Despite his overtures, no international businesses have committed to locating in the city. “We’re struggling,” he admits. Mai Alzarou and her family are typical of Rawabi residents. 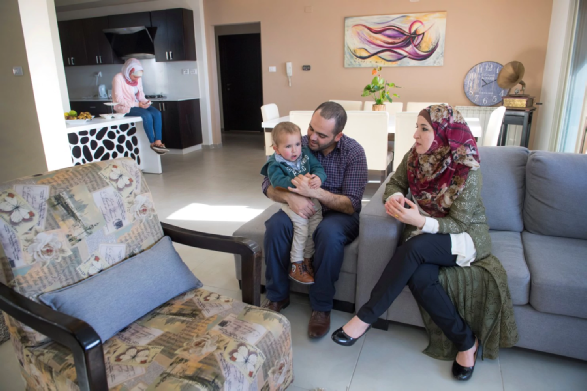 Alzarou, 25, an English teacher, her salesman husband and nine-month-old daughter moved to the city from Bethlehem last autumn. Their three-bedroom, three-bathroom apartment was on sale for $120,000, but the Alzarous took advantage of a “rent-to-buy” scheme. They are paying $500 a month in rent for two-and-a-half years, and then will pay off the balance with a combination of savings and mortgage. “In Palestine we usually live in extended families. But not all young people think this is the best way. We wanted our own apartment with new neighbours,” she said. According to Jaradat, typical buyers are in their 30s with young families, with both husband and wife working outside the home in the private sector, well-educated and looking for a new lifestyle among other young families. Among the first 700 families, 10% are Christian compared to 3% in the overall population. How far and how deep the changes go is not known. Is Rawabi a momentous trailblazer or a colossal folly? Masri has no doubt, but others are watching cautiously. 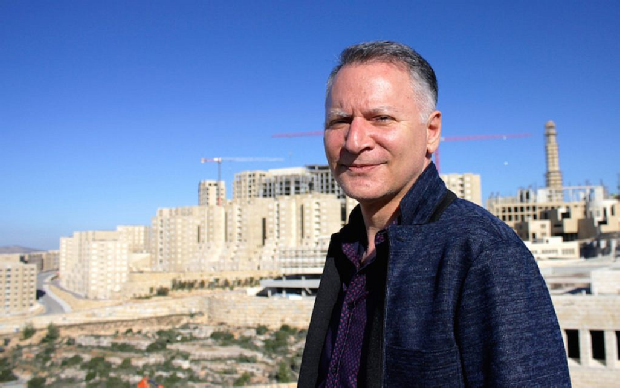 Bashar Masri is the developer behind Rawabi, the first planned Palestinian city. RAWABI, West Bank — At the first pre-planned Palestinian city, a large mosque and hospital are still under construction, the municipality building has only a foundation stone, and two-thirds of the students attending the local school are commuters from outside. Yet at the heart of Rawabi, so far eight years in the making, a tech-oriented business center has recently opened. Its designers hope it can serve as the nucleus of a future Palestinian state’s own Silicon Valley. The Palestinian high-tech field is still in its infancy, and only a handful of startups have succeeded. None has been bought out by larger international companies. Yet, like many countries in which natural resources are scarce, high-tech is the great wireless hope of the Palestinian economy, in which unemployment is at 27%. Masri and his team hope that Rawabi’s tech hub can evolve into an epicenter of Palestinian high-tech, a small concentrated cluster that will slowly develop into a bustling technological environment. But it’s still early days. The new collaborative workspace and incubator, named “Connect,” give a great first impression. The center has a sleek, new-age design akin to a WeWork space, with ample room and big desks for co-working. Connect members have access to the internal infrastructure of the entire tech hub, which means three internet lines — two Palestinian and one Israeli — plus a secure VPN and access to a state-of-the-art data storage center. Membership in Connect is just $50 a month, compared to the $175 monthly fee for WeWork in Tel Aviv. The price for office space, according to Sari Taha, the center’s program manager, is on a “case-by-case basis,” and a firm seen to have much potential but little money will be given a break on rent. Taha said Connect is primed to help introduce Palestinian entrepreneurs to European and Asian markets. There is also an onsite investment fund, named Bader, specifically for ICT startups, and a training institute that grants “mini-MBAs” to tech entrepreneurs. Perhaps most importantly, the center is located within Rawabi’s swanky shopping plaza, the only place where Palestinians can shop for the world’s leading fashion labels and have a coffee at one of several cafés. BUT IS ALL THIS ENOUGH TO DRAW IN CLIENTS? According to Taha, Connect currently houses four companies: WebTeb, an Arabic version of WebMD; Studio 83, which does 3D visualization for real estate companies; one person who works for a German car-sharing startup called GETAWAY; and Imagry, which develops software for automated driving. WebTeb, Connect’s star client, received a $1.9 million grant from Masri’s venture capital fund Siraj, according to the website Crunchbase, which publishes data on companies. WebTeb was founded in Haifa, Israel. The current CEO, however, is now based in Dubai. Imagry was also founded and based in Haifa. All four companies in Connect receive funding from one of Masri’s venture capital funds (Siraj along with Bader), Taha said. There are also several freelancers working out of Connect and several restaurants in the commercial center that are independent and run by local businesspeople. As in Connect, all the companies based in Rawabi’s business center are also exclusively owned by Masri or funded by one of his companies. These include the software developer Asal Technologies, the Palestinian leasing company Pallease, and a new Palestinian bank called the National Bank, which is funded by one of Masri’s VC funds. The Israeli tech giant Mellanox — which makes technology that connects computers, databases and servers — and Microsoft’s headquarters in Israel both outsource to Asal and therefore have employees working in Rawabi. According to Masri, there are tens of companies actively considering the idea of moving to Rawabi. “They are still testing the waters,” he said. The seasoned businessman does not hide the fact that the city he built is populated by his own companies. “Asal came here because I said so. If I don’t show that my companies are here, I can’t expect others to come,” he said. “We haven’t succeeded yet,” he added, noting that his tech hub is only “25%” along its way. Sam Bahour, a well-known Palestinian-American businessman and a policy adviser to Al-Shabaka, a Palestinian think tank, said “it’s too early” to judge whether Rawabi’s tech hub could be successful. “Three months is nothing in trying to recruit international contracts. They’ve only recently finished the infrastructure,” he said of Connect. Bahour, however, did think Rawabi should have been able to secure some companies to open offices in the larger business center, which opened around nine months ago. “The building space is being marketed heavily. They are trying to recruit companies to go there other than his own. If that hasn’t happened yet, that should be if not a red light, at least a yellow light that something is wrong,” he said. Bahour, who is a vocal critic of Israel’s military rule in the West Bank, said the instability created by political conflict is likely a key factor keeping both local and international companies away from Rawabi. “It’s placed in an area away from the city center of Ramallah and the city center of Nablus. And given the fragmentation that we live in, that may be a hindrance for people” afraid something may occur to block their access to Rawabi. He pointed out that Israel continues to restrict access to Rawabi by preventing the city from building a larger access road. The current access road is located in Area C of the West Bank, where Israel has full military control. Bahour also argued Israel’s control over to Rawabi’s water supply increases instability fears. Rawabi was ready for residents to start entering their homes in 2014, but it took Israel, which controls the flow of water into Palestinian cities, more than two years to agree to connect the new city to the grid. Currently, Israel supplies enough water for Rawabi’s some 4,000 residents, many of whom only live there part-time. Masri fears when more people move in, Israel could again drag its feet in increasing the water supply. While Israeli bureaucracy has created a number of setbacks for Rawabi, Masri admits that proximity to the “startup nation” is the tech hub’s biggest advantage. “Let there be no secret: our target is through Israel. We are piggybacking and using the advancements and achievements of Israel,” said Masri. One hope is that large multinational companies with headquarters in Israel, such as Google or Intel, will open up outsourcing offices in Rawabi. Another hope is that Israeli companies themselves will outsource to their Palestinian neighbors. Masri noted that while Jordan and Egypt can offer cheaper human resources, they cannot create relationships with Israeli companies like Palestinians can. “We are not looking to compete by having the lowest prices. We are looking to compete with a package, and the package involves the super high-tech that’s next door to us,” he said. It has been more than two years since a Palestinian-American businessman raised $1 billion to build Rawabi, a new Palestinian city on the West Bank with the hope that it will create prosperity and peace in the area. Now, the first planned city designed for a population of at least 40,000 people is putting the finishing touches on its infrastructure and plans to open in June.